Here is a great blog post by Johnny1975 about the personal benefits you can derive from traveling a lot. I concur with it. But I would like to add a few benefits I experienced of my own. - Slowing down of time: If you live a life of routine where you do the same thing everyday, like most Americans and Asians do, there are no special memories or new experiences. So time moves faster and you remember nothing because there are no meaningful memories to retain. But when you travel or have new experiences, each moment is new and you have to pay attention and be mindful of it. As a result, time goes slow because each moment triggers your focused awareness. When you see new things, you are more focused and sharp too. You also have to think on your toes and figure things out in a new culture or country. It's kind of like when you spend all day at Disneyland experiencing new rides as a kid, if you remember, that day felt like a long day, because the rides and attractions were exciting and every moment you were seeing and experiencing something. At the end of the day you were exhausted and it felt like a very long day. That's what travel is like too. It slows down time so you experience time more like you did when you were a kid. So if you feel that time is moving too fast, or your routine has no memories or experiences, then traveling more long term will help slow down time and make each moment more meaningful and memorable. As the greatest mythologist Joseph Campbell said: "I don't believe people are looking for the meaning of life as much as they are looking for the experience of being alive." - Meditation benefit. As you know, one of the goals of meditation is to help your mind detach from desire and ego, so you suffer less. That's a central aim of Buddhism and Zen. Traveling long term helps you do that too, because as you move from one place to another, you jettison the people, places and things there, to move on to the next location. Once you get used to that, jettisoning things from your mind gets easier and easier. Thus it becomes easier for you to let go and detach from your environment when you need to. This gives you GREATER CONTROL over your mind so that when you need to detach your mind from something bad or toxic, it becomes easier to do so once you've been used to your travel mode. I discovered this benefit after traveling in Russia a lot. - Also when you are outside your country, like America for example, you can see it a lot clearer and more objectively than when you are in it. This increases your understanding of America too, so you can see through its delusions and illusions and false teachings. Hope that helps inspire you to travel. 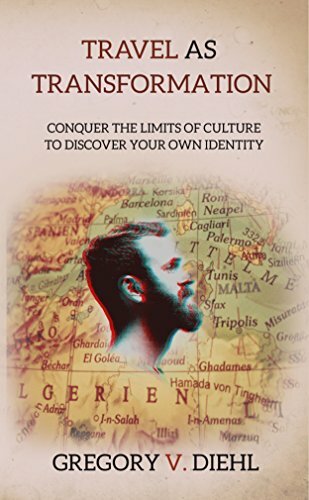 Interesting book about how travel transforms you and changes your self-identity and perception of yourself. When you travel to a foreign land, do you experience this new place as your old self? Or do you become a new version of you? From living in a van in San Diego to growing chocolate with indigenous tribes in Central America, to teaching in the Middle East and volunteering in Africa, Gregory V. Diehl has spent his entire adult life discovering the world and himself. Leaving his California home shortly after his 18th birthday, he went on to live and work in 45 countries across the globe by age 28. By recounting the existential lessons from his journey, Diehl challenges the reader to question how their identity has been shaped by the culture and lifestyle they know. He argues, compellingly, that travel can transform your perception of yourself along with the world. By losing your comfortable sense of self, you learn to examine your life through the structure of everything it can become. To travel solo a truly open mind is to forget who you were when you started. It is to be constantly born anew, to discover your strengths and find your path in life. Travel As Transformation will give you the wisdom, the inspiration, and the resources to conquer the limitations placed by your arbitrary past. Whether traveler or non-traveler, its lessons about approaching the uncomfortable and unfamiliar apply to everyone. Wow. 8 Health benefits of travel! i like travel to meet new people (mostly guys) of different cultures and customs and view locations only available in that country. international travel is very exciting to me. Dangerous time to travel as an American?